The 30th blog of my 31-in-31 challenge. Wow. Has March gone past this quickly for everyone, or is it just me? I can’t believe that it will be April on Sunday. Today’s prompt is about big dreams…what you hope for in the future. 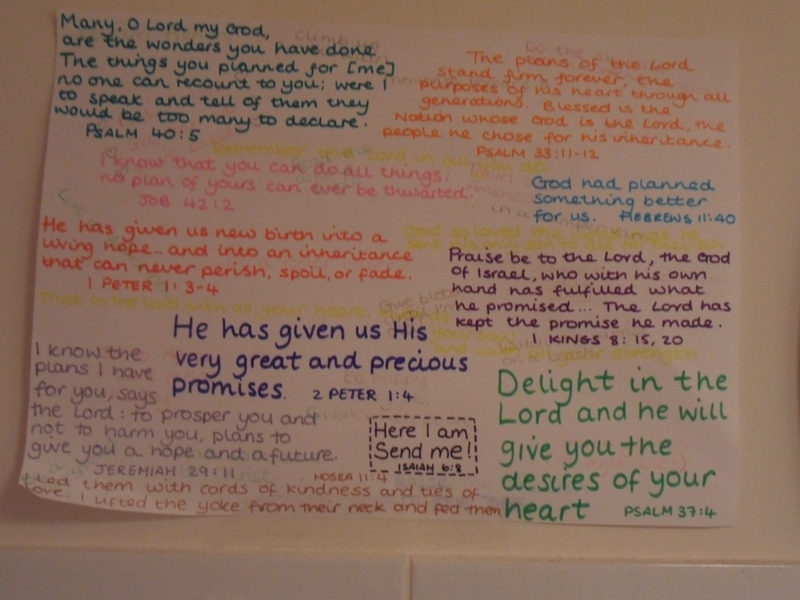 I have a poster in my bathroom, which I made during a discipleship time with two of the three girls I mentor. We were talking about plans, and what we hope to have/achieve/do in our lives. We each wrote these down on a piece of paper, in pencil. And then we wrote Bible verses about God’s plans all over it, in bright pen. Mine’s a little tatty now, and at some point I want to redo it (and laminate it?) since I want to keep it on my wall for longer. The bathroom tends not to be the best place for paper things to stay neat, as the steam from the shower curls the edges. Most days I don’t feel like I have a plan. But I know that God’s plan is greater than mine. All the things I want in life…the things I’ve written down in pencil…are completely covered by His plans for me. That’s why we wrote over the pencil with bright pens – to remind us that God’s plans come first, and are for the best of us.